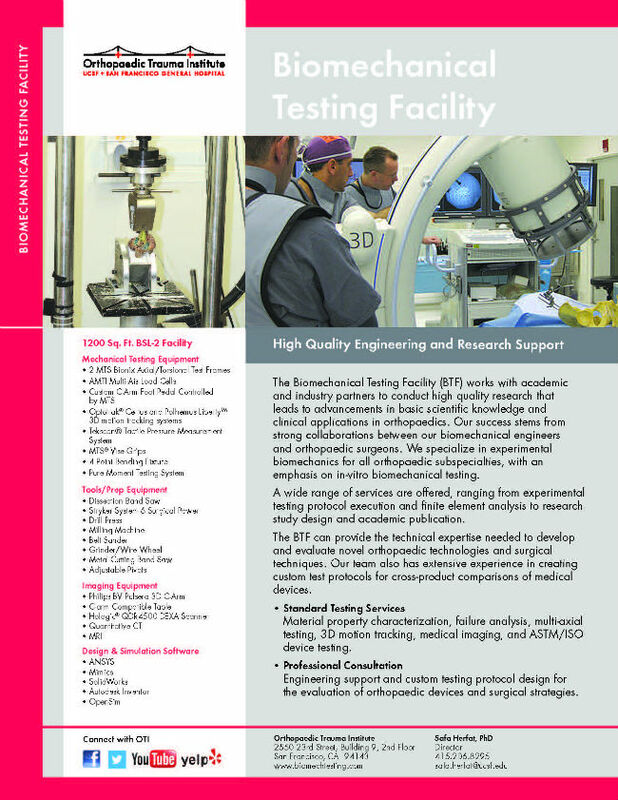 The Biomechanical Testing Facility (BTF) is directed by Safa Herfat, PhD. Dr. Herfat joined UCSF in 2012 as the Director of the Biomechanical Testing Facility (BTF) and became research faculty in 2014. His expertise is in the biomechanical testing of medical devices, surgical instruments, and cadaveric fracture fixation and spine stabilization constructs. While he continues to conduct industry-funded evaluations of orthopaedic medical devices and surgical techniques, his research focuses on integrating experimental biomechanical testing, finite element analysis and clinical outcomes to develop devices and surgical strategies that will improve patient outcomes. Dr. Herfat also collaborates with other faculty at the Orthopaedic Trauma Institute and UC Berkeley to develop implantable orthopaedic sensors. Short-term projects that consist of existing IRC experimental protocols. We will execute the experiment and post-process the data on an expedited time schedule. Research Agreements are longer term projects with custom-designed experimental protocols. In addition to planning and executing the experiment, we will collaborate with you to interpret and publish the data. For more information about our excellent research opportunities, please contact Safa Herfat, Ph.D. at Safa.Herfat@ucsf.edu. The Orthopaedic Trauma Institute (OTI) is a collaboration between the University of California, San Francisco (UCSF) and Zuckerberg San Francisco General (ZSFG). The OTI is the only trauma center in San Francisco specializing in the treatment and rehabilitation of musculoskeletal injuries. Regardless of where you live or which health insurance policy you carry, if you suffer a life- or limb-threatening injury in San Francisco, the ambulance will bring you to Zuckerberg San Francisco General Hospital and Trauma Center. Once there, you’ll find our team of UCSF Orthopaedic Department surgeons, specially trained to mend complex fractures all over the body. Please consider donating to the Orthopaedic Trauma Institute (OTI) to help expand our national and global advances in: Patient Care, Education, Research, and Outreach- Thank you!